The next election to be held in Madera County is the Statewide Direct Primary Election. 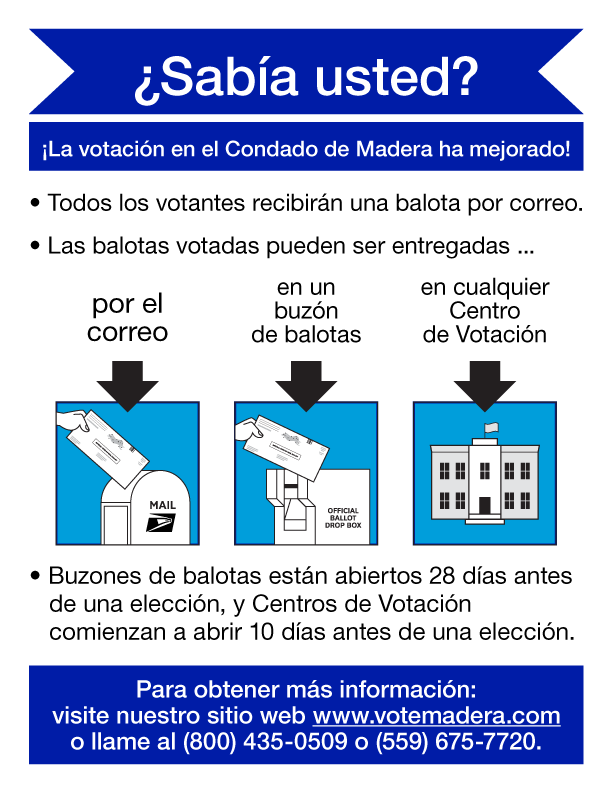 Vote Centers offer ballots and language assistance in English, Spanish and Punjabi. the form for processing by not later than May 29, 2018. 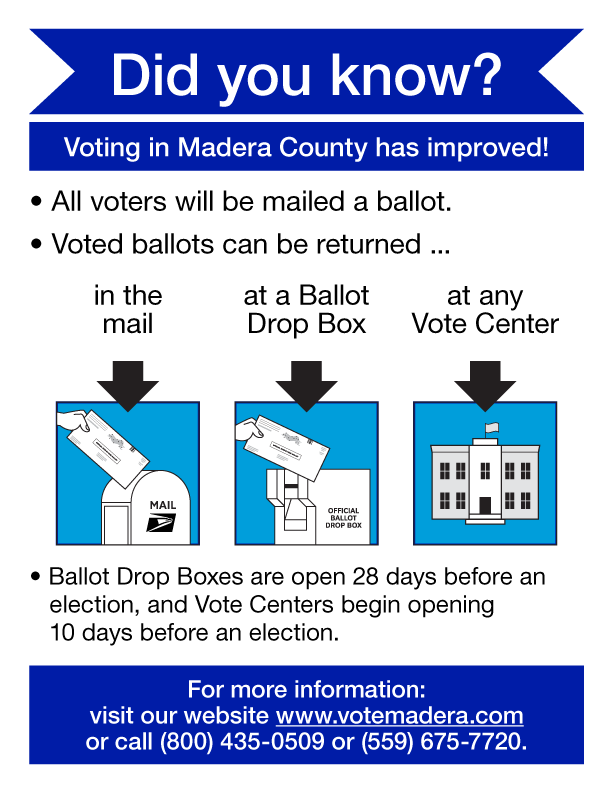 Click the links below to view the Madera County Voter Information Guides or the State Voter Information Guide. To determine which guide to view, look at the booklet you received with your ballot packet, the ballot type is found on the bottom left corner and is noted with BT-1, BT-2, etc. If you don’t have your guide, you can also look at your blue ballot envelope. The ballot type will appear as BAL 001, BAL 002, etc. Lastly, our staff can email you your specific guide upon request. Call our office at 800-435-0509 or email us at electionsinfo@maderacounty.com to request your copy. Press Release – Madera and Oakhurst Vote Centers Now Open! All voters, regardless of the party preference they disclosed upon registration, or refusal to disclose a party preference, may vote for any candidate for a voter-nominated or nonpartisan office. The party preference, if any, designated by a candidate for a voter-nominated office is selected by the candidate and is shown for the information of the voters only. It does not imply that the candidate is nominated or endorsed by the party or that the party approves of the candidate. The party preference, if any, of a candidate for a nonpartisan office does not appear on the ballot.